Black and white Wake me up at Camden badge. This is for anyone that's prone to falling asleep on the Tube and misses their stop. It's a little fun and it tells people that you'd like them to wake you up at your station. 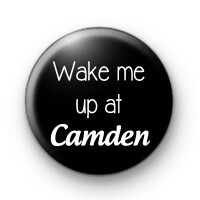 If it's not Camden then you can customise this badge to say whatever station you need. Have you ever fallen asleep on the London Underground? All our badges are handmade and 1-inch in size.